Before we begin, please bear in mind we are not instructing you how to do the job, the following information is intended for educational purposes only! If you are uncomfortable about doing the job please call a Heating and Air Conditioning Contractor. If you have been told that your air conditioning or heat pump compressor is stuck or in other words mechanically frozen and that you need a new compressor which costs hundreds of dollars, look this Hard Start Kit over! This kit may start the compressor, but mechanically frozen compressors may still need to be replaced, however these are worth a try. These work 75% of the time! The unit we sell below is the largest of the Supra Hard Start Kits and supply OVER 600% increase in starting torque! If this unit won't start the compressor we know of no other start kit that will! This is the item that no H.V.A.C. Contractor wants you to know about! This device installs with (2) wires. One wire goes to the RUN side of your compressor run capacitor and the other wire goes to the START side of the compressor Run capacitor. ( Follow the large wires that come out of the compressor until they end up at the large RUN capacitor for the compressor ). Shut the circuit breaker off at your main electric panel, if you aren't sure which one it is then shut them all off. There may be more than one breaker. 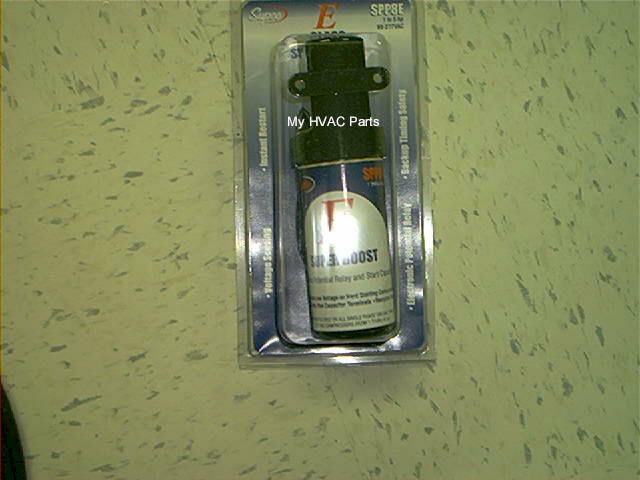 Once you are sure the 230 Volt power is off to the Air Conditioner or Heat Pump you will need to Dis charge the compressor run capacitor by shorting it's terminals out to a bare metal part of the cabinet with an insulated tool such as a screwdriver. These capacitors store a high amount of power which will give a nasty shock. While it won't kill you, it does hurt! See the picture below for a typical run capacitor made for just the compressor, it will have only 2 terminals. One wire of the Hard Start Kit goes to one terminal the other wire of the Hard Start Kit goes to the other terminal. If you have a Dual Rated capacitor you will see (3) terminals marked Herm, Fan and C. This Hard start kit goes to the "C' and Herm terminals. The fan terminal is for the condenser fan do not use this terminal. These Dual Rated Capacitors run the compressor and the fan with just this one capacitor. 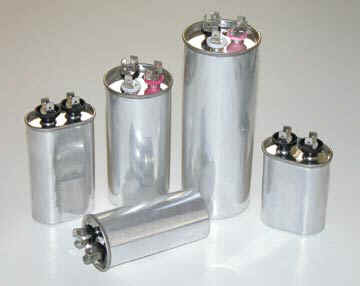 Here are some typical run capacitors. Shown are round capacitors, there are also oval run capacitors used in many systems. The ones with (2) terminals require (1) capacitor for the fan motor and still another for the compressor. Dual rated capacitors have (3) terminals and only need (1) capacitor as the fan and compressor run off just this (1) capacitor. Item pictured is not the SPP7S model and is for demonstration purposes only. The SPP7S is similar however.